I realize it has been awhile since I blogged. A lot has happened in the last year. 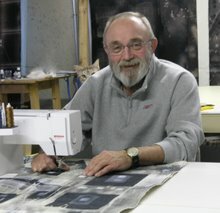 Bob got into Quilt National for the 4th time (4 out of 5 entries...I'm proud of him). We of course went to Athens and met up with old friends. We re-connected with Glenys Mann from Australia . We met Glenys back in 96 or 97 at QSDS when it was held at the Josehpina in Columbus. Glenys asked Bob to come to Australia to teach for 2 weeks next fall. As those who have taken a class from Bob you know that I am always hanging out in the class. But I think I may pass up this trip. Two days after the last class he is teaching for Pro Chemical in Massachusetts and I think I better stay back and get all his material to Fall River. So I will spend that time visiting family and friends on the east coast. We moved (for the winter only but our winter started in October) to California. I am thinking I could stay here forever. Our son has a small condo that is not selling right now so he asked us to come out and this way we can spend time with the grand children. We went from no grand kids a few years ago to soon having 5. We now have 3 step grandkids ages 13, 11, and 9 and then they had a boy a year ago July and another boy is on the way, due in January. The condo is only 560 square feet. Rather small. Bob is teaching several classes out here in California so he brought many quilts to show as examples in class. He also bought his George sewing machine and his Bernina. So the entire condo is his studio now. I have a small corner of the bedroom for my computers and printers. But that is all I need. Especially when it is the of December and the windows are open and we are comfortable on the coldest day with just a light jacket or sweatshirt. Tim is the Strength and Conditioning Coach for the LA Kings Hockey team so we get to go to as many home hockey games as we want. We are having a great time out here and Bob still has time to do his quilting. We do miss being able to run up to Chicago to see our daughter Amy and her husband. That's about all for now. I won't wait so long before my next blog.